Patient with endometrial cancer / endometrial carcinoma may present with lower abdominal pain and postmenopausal vaginal bleeding. There will be obstruction of the cervix with hematometra/ blood or pus / pyometra. The common risk factors of developing endometrial cancer/ endometrial carcinoma include hypertension, unopposed use of estrogen, diabetes, nulliparity and obesity. Endometrial cancer mostly present initially with endometrial hyperplasia. Endometrial hyperplasia is associated with abnormal proliferation of the endometrial gland due to excessive estrogen. From endometrial hyperplasia it later progress into endometrial carcinoma. Endometrial cancer/ endometrial carcinoma may present as localized polypoid tumor or it may diffuse and involved the entire surface of the endometrium. 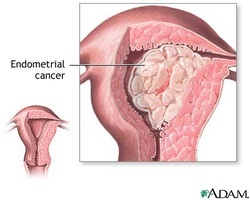 Endometrial carcinoma / endometrial cancer is an adenocarcinoma type of cancer. There are malignant stratified columnar epithelial cells and mixture of squamous cells carcinoma as well as glands. The treatment may focus on radiation therapy and total hysterectomy with bilateral salpingo - oophorectomy.